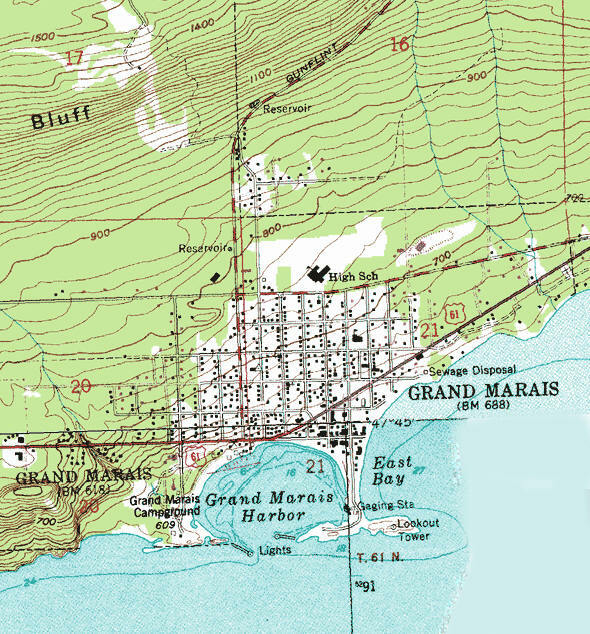 Do you have photos, historical accounts or other items pertaining to the Grand Marais area? Would you like to share this historical information with the world? LakesnWoods.com would like to publish your Grand Marais photos (current or historical) or historical accounts on this website. Original materials can be returned and your privacy will be respected. 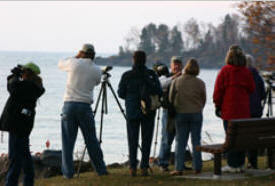 Grand Marais, located on the beautiful, rugged shore of Lake Superior, is an ideal four-season vacation getaway. This charming town is located at the foot of the Gunflint Trail, the gateway to the famous Boundary Waters Canoe Area Wilderness. 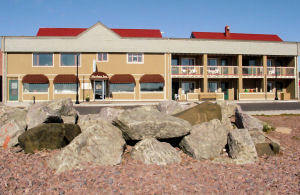 The Harbor Inn is located within easy walking distance of everything to see and do in Grand Marais. A historic logging and fishing village, Grand Marais is rich in cultural and recreational activities and boasts some of the most unique shopping on the North Shore. Relax and enjoy the harbor with a walk to the lighthouse and scenic Artist Point. 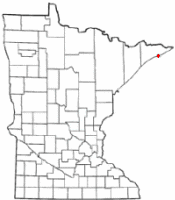 Grand Marais is a city in Cook County, Minnesota. It is the county seat of Cook County. According to the United States Census Bureau, the city has a total area of 2.90 square miles (7.51 km²), all of it land. Grand Marais is located on the northwestern shore of Lake Superior in northeastern Minnesota, and is well known as an entry point for the Boundary Waters Canoe Area Wilderness. 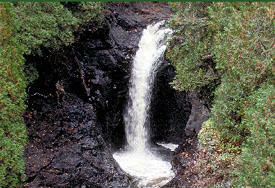 The Superior Hiking Trail passes near Grand Marais and Judge C. R. Magney State Park is nearby with the peculiar Devil's Kettle waterfalls. The land surrounding Grand Marais slopes up to form the Sawtooth Bluff, a dramatic rock face visible from nearly any vantage point in the city. Adjacent to the bluff is Pincushion Mountain, a large bald monolith with dramatic views of Lake Superior and the inland wilderness. 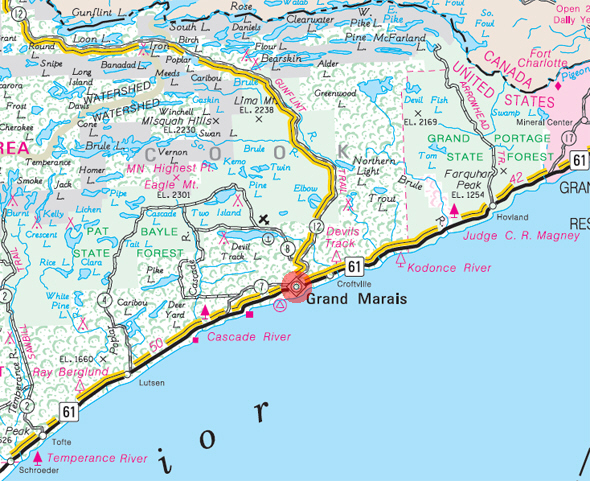 Grand Marais Harbor is protected by Artist's Point, a barrier island formed by lava that was connected to the mainland by gravel deposited by lake currents, forming a tombolo. An Arctic–alpine disjunct community survives there. 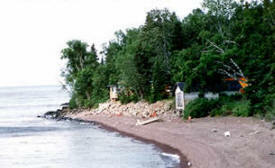 Road access to Grand Marais is by Minnesota Highway 61, which generally follows the shore of Lake Superior and is known as the North Shore Scenic Drive. The Gunflint Trail (Cook County 12) begins in Grand Marais and heads northeast away from the lake and into the Boundary Waters region. 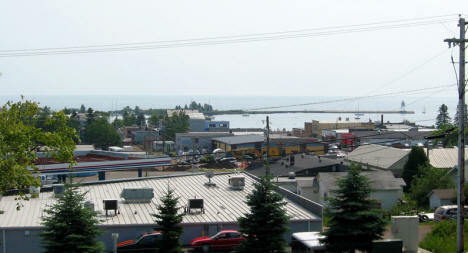 A view of downtown Grand Marais and Grand Marais harbor taken July 28, 2004. As of the census of 2010, there were 1,351 people, 673 households, and 331 families residing in the city. 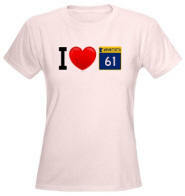 The population density was 465.9 inhabitants per square mile (179.9/km2). There were 863 housing units, with an average density of 297.6 per square mile (114.9/km2). The racial makeup of the city was 93.4% white, 0.4% African American, 2.4% Native American, 0.5% Asian, 0.1% Pacific Islander, 0.6% from other races, and 2.5% from two or more races. Hispanic and Latino residents of any race were 1.6% of the population. The median age in the city was 48.4 years; 18.1% of residents were under the age of 18; 5.1% were between the ages of 18 and 24; 23.2% were from 25 to 44; 30.8% were from 45 to 64; and 23% were 65 years of age or older. The gender makeup of the city was 45.9% male and 54.1% female. The city of Grand Marais in Rosebush Township (T. 61N, R. 1E), sections 20 and 21, was incorporated on April 21, 1903, and separated from the township on March 27, 1906. Ed. W. Wakelin purchased the first piece of property on the bay in 1872; by the end of 1873, Wakelin, Henry Mayhew and Samuel F. Howenstein owned all the land comprising the original village and lands along West and East Bays and retained control until the early 1900s in spite of buildings, docks, warehouses, railroad rights-of-way, and ore docks. The Mayhew brothers, Henry and Thomas W., had a store on the point made by the bays that served as a trading post; Joseph E. Mayhew was the first lighthouse keeper in 1886. 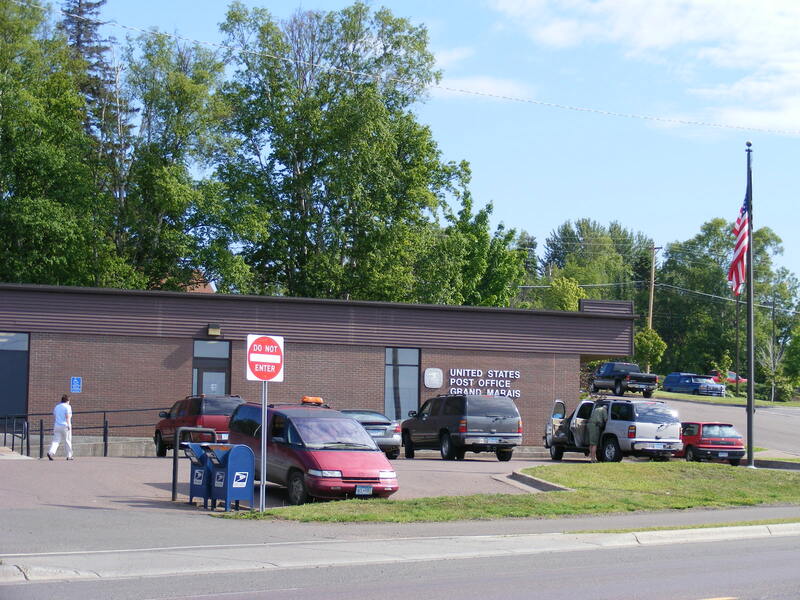 The post office was established in Superior County, Wis., 1856-57, changed its name to Hiawatha, 1857-58, and became Grand Marais in 1873. 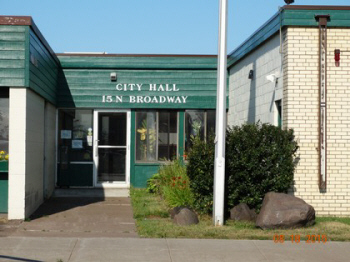 City Hall Office Hours are from 8:00 am - 4:30 pm Monday through Friday. Discovering the birds, wildflowers, geology and more of this dynamic and rich northern landscape is the focus of the festival. A series of inter-related, field-focused workshops and courses (1-3 days in length) form the backbone of the event. Classic cars on display in Downtown Grand Marais, on Wisconsin Street. Once again the quaint streets of Grand Marais came alive during the 21st annual Grand Marais Arts Festival organized by the Grand Marais Art Colony. Over 70 local and regional artists set up by the glistening shores of Lake Superior for two days during the peak of summer to showcase their unique handcrafted work and provide insight into their artistic process through demonstration and dialogue. A fun weekend for paddlers and spectators of all ages! Friday night parade, Saturday youth & adult races, activities for the kids. 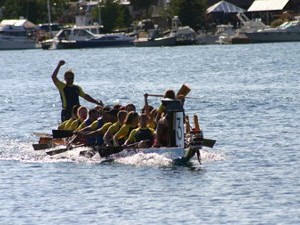 Come to paddle or watch the action on the Grand Marais Harbor. Individual & team registration available. 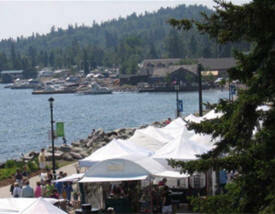 Events all weekend, centered around the Grand Marais harbor and downtown Grand Marais. 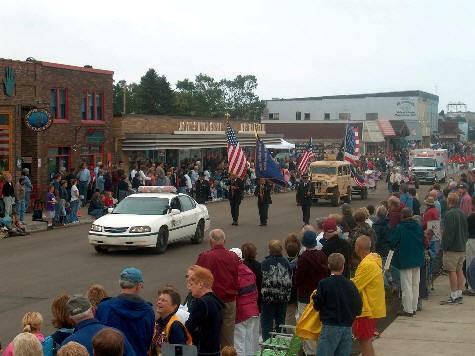 Grand Marais' favorite festival! Sports/fishing tournaments, kid's carnival, live music, parade, fireworks, activities and food vendors. $10,000 grand prize raffle! Get Your raffle tickets for the $10,000 cash prize plus 100's of other prizes. 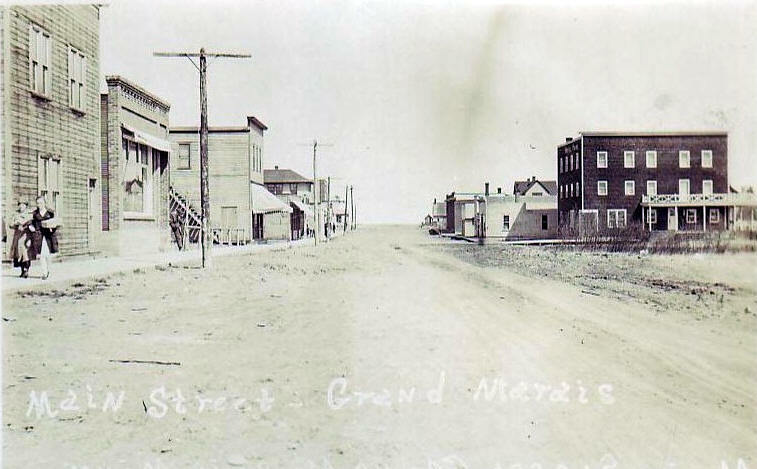 Tickets can be purchased from local area merchants next time you visit Grand Marais or during the picnic from any Lion you see roaming the streets wearing a gold and purple vest. Need not be present to win. 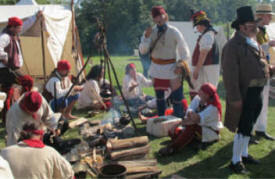 The hustle and bustle of summer activity peaked with the North West Company Rendezvous held here at Grand Portage. This was the time when furs from wintering posts, which reached into Canada, were delivered down the historic Grand Portage. The annual Rendezvous is still celebrated here during the second weekend of August. The event is held in conjunction with the Rendezvous Days Powwow, sponsored by the Grand Portage Band of Lake Superior Chippewa. The annual gathering is our biggest and most grand celebration of the year, a time when Grand Portage comes alive and reflects on its rich heritage. Re-enactors from across the country and Canada gather to camp and challenge each other to games and skills from our historic past. This is one event you do not want to miss. Music, dancing, craft demonstrations and hands-on workshops ensure an exciting weekend at the Grand Portage National Monument! The Sawtooth Challenge Mountain Bike Race is for all level of riders, offering races with distances from 8-24 miles. 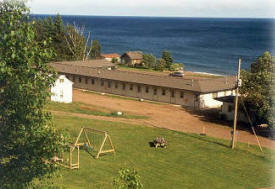 Come relax and enjoy Grand Marais and the beautiful North Shore of Lake Superior. 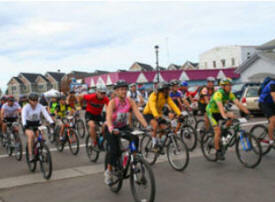 The mountain bike races will consist of beginner, sport and expert level races. Beginning in downtown Grand Marais near Artist's Point, riders cross Highway 61 and climb by way of snowmobile and ski trails to the Pincushion Mountain Recreation Area. The race takes full advantage of the unique wilderness terrain and the 1000 vertical feet between Lake Superior and the Sawtooth Mountains. After climbing from Grand Marais, the race enters the Pincushion Mountain ski trails, with its variety of terrain, before joining the Pincushion Mountain Single Track section (Sport and Expert classes only). 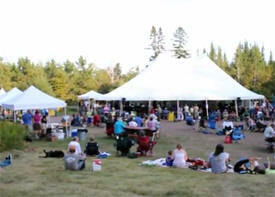 Area residents and visitors of all ages came together for two days of music in September at Sweetheart’s Bluff in Grand Marais as part of the fourth annual Radio Waves Music Festival, sponsored by WTIP North Shore Community Radio and the North Shore Music Association. 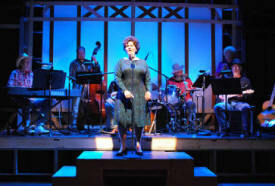 The line-up offered a variety of genres from rock to folk, jazz, swing and country. More than 1,000 people came through the gates over the two days. 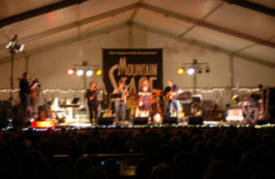 The modest $5 admission per adult helped offset the cost of staging the festival; the rest was covered by a grant from the Arrowhead Regional Arts Council. “It’s important to note that Radio Waves isn’t a fundraiser for us,” says Deb Benedict, WTIP’s executive director. The festival is designed as a community event, bringing people together to enjoy the extraordinary talent and diversity of the area. Grand Marais is crazy for Moose Madness! While the teachers have their conventions, we play - it's the last long fall weekend before the snow flies. It's also rutting season, and signs of moose are all over town - in shops, cafes, lodging facilities and many locations outdoors. Our favorite alces alces, Murray, will be around town for the much sought-after photo opp, and moose-related activities are planned for all! 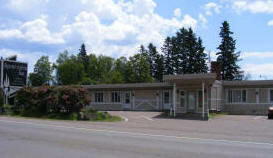 Stop at Moose Central (the Grand Marais/Gunflint Trail Visitor Information Center, 13 N. Broadway Avenue) - it's where you'll find the schedule for the weekend, contest entry forms, instructions, maps for downtown Grand Marais and Cook County, Moose Medallion Hunt clues, Moose Bucks and prizes! Hours: Mon. - Thurs, 9am - 5pm, Friday & Saturday 9am - 6pm and Sunday 9am - 2pm. 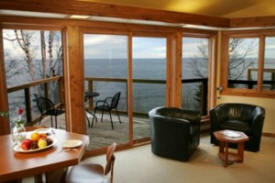 Reserve your rooms now for your bluegrass weekend at Lutsen Resort on Lake Superior! 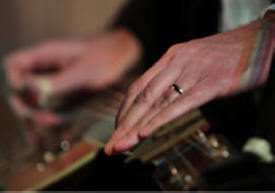 Each year the North Shore Music Association sponsors a great weekend for bluegrass musicians and fans. Friday is check-in, registration and jamming, Saturday is workshops, more jamming and an evening concert by our featured group, and Sunday is... more jamming before check-out. It's a pickin' weekend in a relaxed setting, and a wonderful opportunity to connect with your bluegrass friends. There's no cap on workshop participants, so relax and register when you arrive. Lake Superior sport fishing for trout and salmon aboard a 28 ft Sportfisherman. 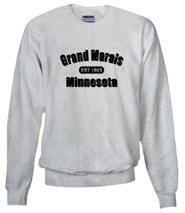 Based out of the beautiful harbor town of Grand Marais. 20 years charter experience. 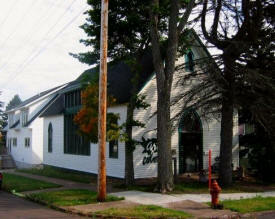 The Grand Marais Art Colony is Minnesota's oldest art colony. Begun in 1947 as The Outdoor School of Painting, it was, until 1958, a project of the Minneapolis School of Art, forerunner of MCAD. 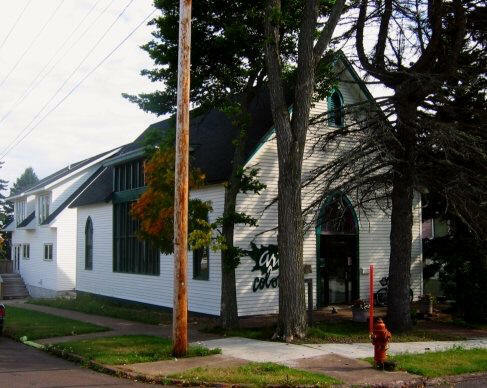 Located on the rugged northshore of Lake Superior, the Art Colony is housed in the heart of the coastal village of Grand Marais in a 1918 mission church. Campground, Swimming Pool, Marina, Playground, softball field, pavilion and much more. 300 campsites; 161 full hookups, 82 electric and water hookups and 57 rustic sites open year round; water is on May-October. Wake up to . . . fresh air, bird song and waves on the shore. Stroll the cobblestone beach, build a campfire, skip rocks in the harbor and enjoy the the cool lake breeze. Lake Superior's beauty is waiting for you at Grand Marais' municipal campground. The Cook County Historical Society operates the Johnson Heritage Post Art Gallery in Grand Marais, Minnesota. The nonprofit Art Gallery features local, regional, and national artists in revolving exhibits, as well as featuring a permanent collection of original art by Anna Johnson, an early 1900s artist. 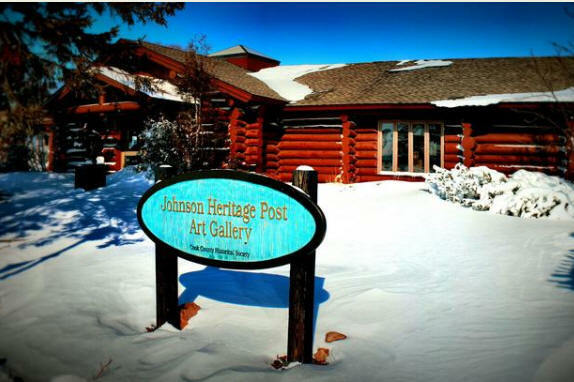 The Johnson Heritage Post Selection Committee is interested in submissions from artists who are interested in exhibiting in 2014 and beyond. Enriching lives and building community by teaching traditional northern crafts in a student-centered learning environment that inspires the hands, the heart and the mind. The North Shore Music Association is a non-profit organization dedicated to presenting and supporting musical arts and musicians in northeast Minnesota with a focus on entertainment, education and cultural enrichment. All concerts are held at the Arrowhead Center for the Arts unless noted otherwise. 70.0 km trackset for Classic. 60.0 km skate-ski. Mostly intermediate level trails (45%), with 30% advanced and 25% beginner. 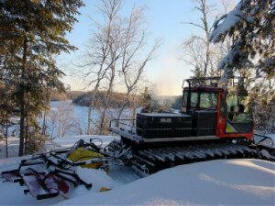 Snowshoe Trails available. Snowshoeing on trails allowed with ski ticket. Numerous scenic views and overlooks while skiing thru the Superior National Forest. Come for the quiet, the solitude, and the famous Devil's Kettle waterfall. The most popular hike leads from the trailhead upstream along the Brule River to Devil's Kettle, where the river splits around a mass of volcanic rock. Half of the river plunges 50 feet into a pool, while the rest pours into a huge pothole. Hillhaven encourages residents to be independent—they may have their own vehicle or use public transportation. Also, Hillhaven staff can transport them within the local area for appointments, visits to friends, and other outings. Residents can participate in community and Senior Center activities. Families are welcome to visit, take residents for outings or overnights, or have family gatherings at the facility. 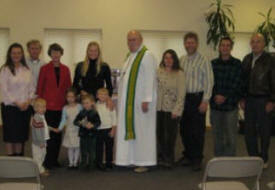 Sawtooth Mountain Clinic, Inc. (SMC) is a private, non-profit organization. It is a federally assisted Community Health Center and has operated successfully under its present corporate status since 1979. The Clinic is governed by a volunteer Board of Directors who is responsible for its operating policy. Physicians are employed by the Clinic. SMC is financed by medical fees, individual gifts from grateful community members, and grants from the federal and state government as well as private foundations. SMC is committed to serving all, regardless of ability to pay. Sliding scale (for reduced fees) is available. 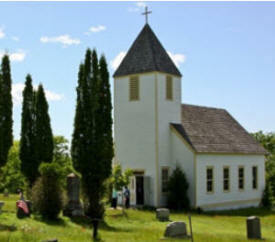 Meets at the Historic Maple Hill Church County Road 54 (off the Gunflint Trail just past the Gunflint Hills Golf Course). Northern Wilds, the Outdoor Newspaper of the North. Covering news and activities along Lake Superior's North Shore, including the Boundary Waters Canoe Area Wilderness, the Gunflint Trail, Duluth, Thunder Bay, and Lake Nipigon. Aspen Inn formerly Grand Marais Super 8 nestled in the forest on the West entrance to Grand Marais, Minnesota. Special quality features make the Aspen Inn a special treat. Tucked in behind landscaped berms, it fits right in with our North Shore wilderness, as many rooms overlook quiet aspen and spruce. Our spacious whirlpool- sauna centered in a sunlit room off a relaxing sundeck is a guest favorite. Aspen Lodge, the ideal four-season vacation getaway near shops, restaurants and entertainment. The beautiful swimming pool, giant whirlpool spa, sauna and sun deck are a favorite for end-of-day relaxing. Aspen Lodge offers lake view king or double queen rooms and family suites, some with In-room spas. The Best Western Superior Inn and Suites is your premier waterfront destination on the North Shore for enjoying the scenic beauty and serenity of Lake Superior. Our "smoke free" hotel has inviting and professionally designed rooms with a panoramic vista of the changing moods of this majestic lake, and are decorated with your relaxation and comfort in mind. Devil Track Resort is a family owned and operated resort located on Devil Track Lake in Grand Marais, Minnesota on the Beautiful North Shore. We are only five years old with completed construction last year! 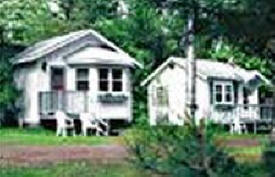 A quaint harbor community offering respite and recreation on Lake Superior’s North Shore. The perfect place to share every sunrise, celebrate each moonrise, embrace the wind and waves of the greatest freshwater lake with awe and wonder. 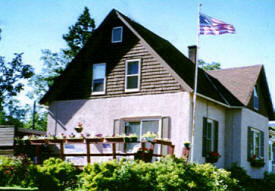 The Grand Marais Inn is located a short distance from the harbor on the west end approach to Grand Marais. Featuring comfortable and affordable rooms and suites, the Grand Marais Inn is a perfect place to stay during your North Shore vacation. 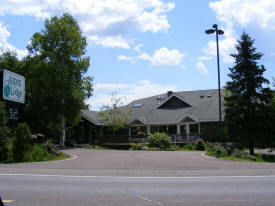 Located on the historic Gunflint Trail, the Gunflint Motel is a quaint five-unit Inn with suite style rooms. All rooms have cathedral ceilings and wood interiors throughout. 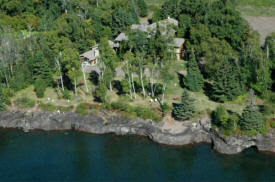 Some also have beautiful views of Lake Superior's harbor and full kitchens. 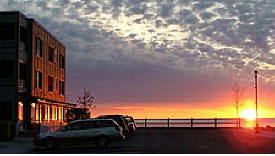 The Harbor Inn is located on Wisconsin St. facing the Grand Marais' natural harbor, giving visitors a spectacular view. All rooms are non-smoking and impeccably clean. "On the Scandinavian Riviera." 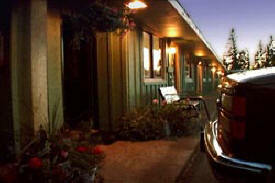 We offer charming, modern housekeeping cottages and deluxe motel units in a serene, secluded setting. Our wooded, spacious grounds overlook the park and harbor. 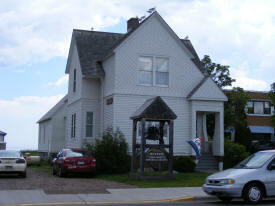 The place to stay in Grand Marais. All rooms are non-smoking. Clean, cozy, and decorated with a personal touch. Just one block from the Shores of Lake Superior. Family owned and operated. Grand Marais' best in-town resort. 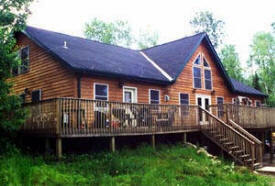 Reasonably priced, large, clean, modern cabins with queen beds and fully equipped kitchens, some with microwaves. Situated in a quiet, park-like atmosphere. Cabins with fireplaces and views of Lake Superior. 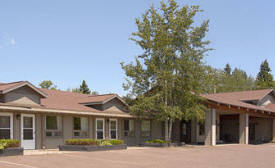 The Outpost Motel welcomes you to Lake Superior's beautiful North Shore! 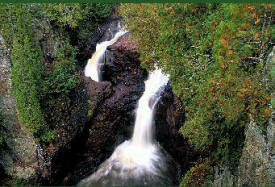 Located between Lake Superior and the Superior National Forest, eight miles from Grand Marais, Minnesota. LOCATION! LOCATION! LOCATION! Artist's Point is at our back door. Quiet, away from U.S. Highway 61. With lake view rooms and sundeck at water's edge, The Shoreline has been first choice for generations of families. Fireside, lake view lobby. 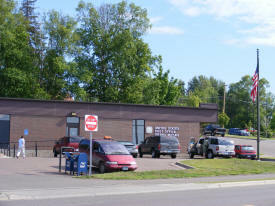 Spruceglen offers convenient drive up to your door parking with additional space for boats and trailers. Limited pets allowed with permission. some smoking rooms available. Year round accommodations featuring 10 uniquely appointed lakeside units overlooking a stunning private ledge rock shoreline. 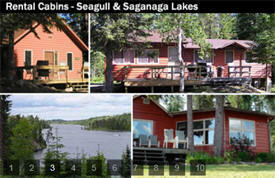 Offering you 8 classic cabins and 8 motel rooms, with a variety of amenities. 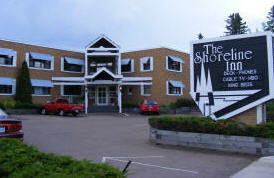 Perfect if you are looking for a clean, old style North Shore resort. Trout Lake Resort is nestled in the heart of the Superior National Forest, 12 miles up the historic Gunflint Trail and then East for 4 miles on the Trout Lake Road into the seclusion of our resort. We are the only resort on the lake and take pride in operating a small, quiet, family resort deep in the northwoods where friendliness prevails. 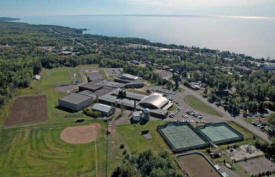 Nestled on the shore of Lake Superior just outside the picturesque town of Grand Marais, Anderson's offers you your own home away from home while visiting the North Shore. 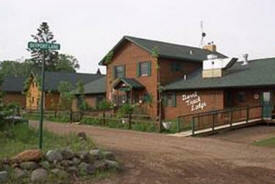 Bearskin Lodge on the Gunflint Trail, Minnesota's family resort offering, lakefront secluded log cabins, canoeing into the BWCA, walleye fishing, boating East Bearskin Lake, family naturalist programs, birding, moose, cross country skiing, snowshoeing, romantic getaways, abundant wildlife. 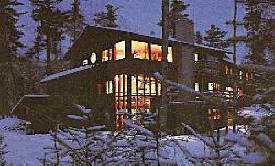 moose viewing, dog sled trips, fine dining. 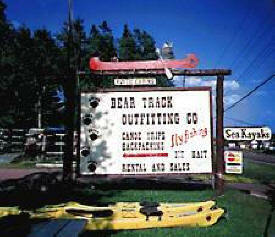 Minnesota Canoe Outfitters at Bear Track Outfitting Co., a year-round Grand Marais, Minnesota Cross Country Skiing Resort, Lake Superior Charter Fishing and Boundary Waters Kayak & Canoe Outfitting business offering year round wilderness adventures for families and youth groups, come stay in our rustic cabins/cabin rentals. 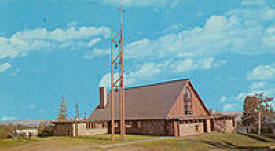 Clearwater Lodge, the only resort on Clearwater Lake, was finished in 1926 by MN pioneer Charlie Boostrom and is the oldest original whole log structure in northeastern Minnesota. 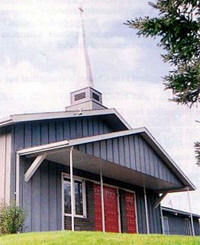 On the National Register of Historic Places, it has retained the look and feel of earlier times. 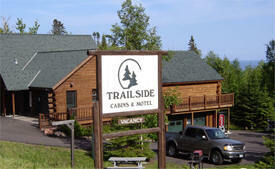 Family owned and operated resort just 3 miles from downtown Grand Marais, MN. 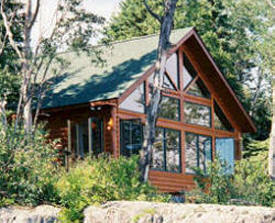 Cozy lakeside cabins ideal for romantic getaways and family vacations. 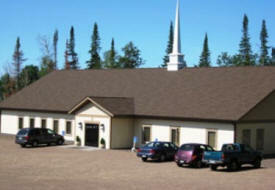 A family oriented, year round resort located on Flour Lake in Northeastern Minnesota on the historic Gunflint Trail and surrounded by the Superior National Forest. 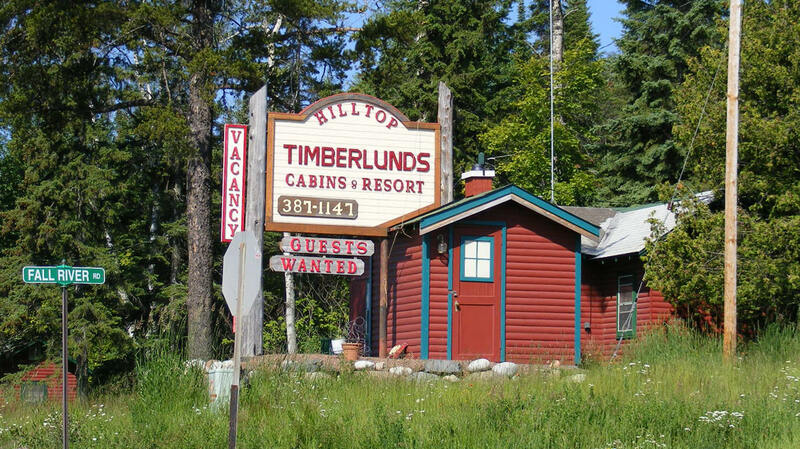 A year round wilderness vacation resort in Northeastern Minnesota, on the Gunflint Trail just north of Grand Marais, offering family vacations, fishing trips, honeymoons, horseback riding packages, women's group retreats, and family reunions. Whether you want a family or fishing vacation in a lakefront cabin, tent, camper or RV, the Gunflint Pines invites you to experience four seasons of outdoor activity. 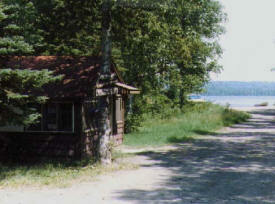 Heston's Lodge offers secluded log cabins on the shore of Gunflint Lake in Northeastern Minnesota, along the route of the Voyageurs. Two housekeeping cabins on Hungry Jack Lake. Our cabins are right on the shore of the lake, and are just one mile by water from the edge of the Boundary Waters Canoe Area Wilderness. When you stay in one of the lakeside log cabins at Loon Lake Lodge lakefront family resort, on the Gunflint Trail in northern Minnesota, you will return to the past and enjoy one of the few remaining original log-constructed resorts on the Gunflint Trail. 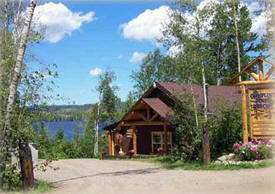 Moosehorn Lodge is located on the sunny north shore of crystal clear Gunflint Lake. Our lodge was originally built in the 1930s and called Borderland Lodge, because of its close proximity to the Canadian border. Located on the historic Gunflint Trail and on the shore of Poplar Lake, Nor'Wester Lodge and Canoe Outfitters is surrounded by the Boundary Waters Canoe Area Wilderness (BWCAW) and Superior National Forest. Located on the shore of Poplar Lake, we are surrounded by Boundary Waters Canoe Area Wilderness along the Minnesota - Canadian border. Lakeside cabins overlooking Seagull and Saganaga Lakes on the end of the Gunflint Trail, 54 Miles Northwest of Grand Marais, Minnesota. 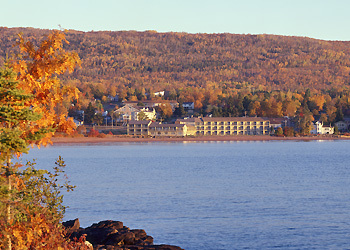 Sugar Beach Resort is located on the north shore of Lake Superior and has become a favorite destination of families for generations. 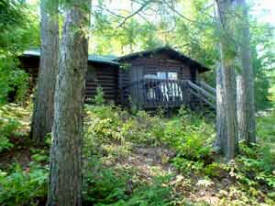 Our cabins provide the quiet warmth and beautiful atmosphere everyone seeks for their vacation getaway. Trout Lake Resort of Grand Marais is an affordable family & pet friendly lake trout and rainbow trout fishing resort, with lakeshore cabins and winter vacation cabin rental. 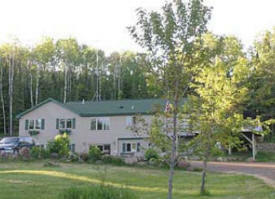 Lodging accommodations with kitchen, boats, motors, pontoon, ice fishing, canoeing. 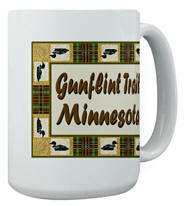 Near BWCAW, Gunflint Trail, north shore, Lake Superior, golf courses. Tuscarora Lodge and Canoe outfitters offers canoe outfitting for the BWCAW and Quetico Provincial Park with ultra light canoe camping equipment. 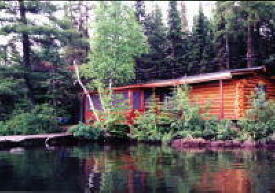 Lakeside cabins on Round Lake, adjacent to the Gunflint Trail are also available. Voyageur Canoe Outfitters is a Gunflint Trail Resort located at the end of the Trail adjacent to the Boundary Waters Canoe Area Wilderness. Voyageur Canoe Outfitters offers a variety of lodging choices for your stay depending upon the type of accommodation you would like. 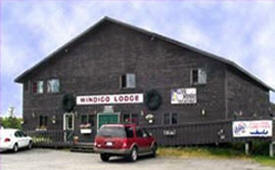 Windigo Lodge offers comfortable cabins set back in the woods or on the lakeshore of Poplar Lake. In addition to cabins, modern Villas are available in our main lodge. 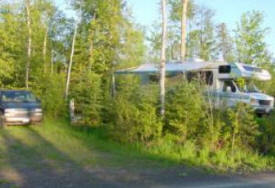 We also have a campground for tent campers and hook-ups for larger motor homes. Come to Cascade for the rushing river and grand waterfalls that lay within a gorge, lush with moss and ferns that grow on black volcanic rocks. Hike the trail through birch, spruce and white cedar; stop to see the views of Lake Superior, the largest freshwater lake in the world. Trails connect with the Superior Hiking Trail and the North Shore State Trail and offer great recreational opportunities to hikers and cross-country skiers. 40 drive-in (including 4 pull through sites) and 4 backpack campsites are available. Showers, flush toilets and dump station available. 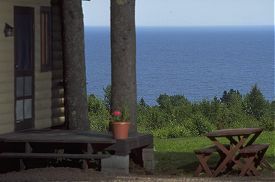 Located in Grand Portage State Forest about 10 miles northeast of Grand Marais, The campground is considered "primitive," designed to furnish only the basic needs of the camper. The campsites consist of a cleared area, fire ring, and table. In addition vault toilets are available. All sites are on a first-come, first-served basis. 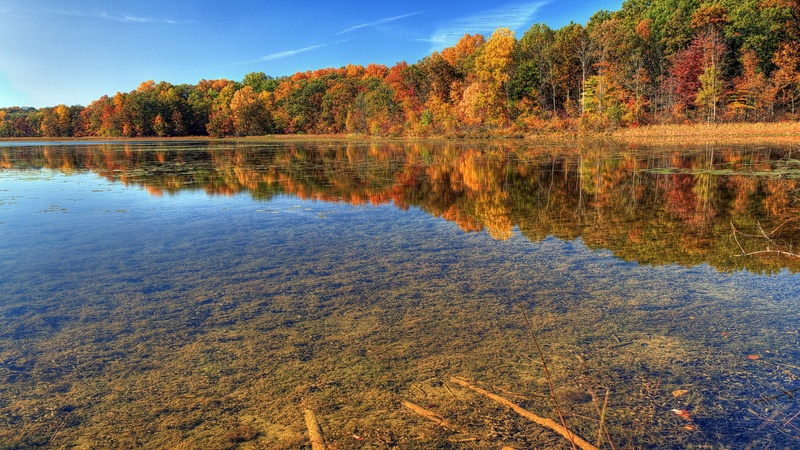 Recreational activities include fishing, swimming, and hiking. 5 campsites. Located in the Superior National Forest, Devil Track Campground is a nicely wooded campground located on the shore of Devil Track Lake. There are many young pines in the area, making it an excellent spot to look for wildlife. Devil Track Lake is a rough translation of the Ojibwe name: 'spirit' would probably better capture the concept than 'devil'. Regardless of the name, the lake is fun to fish. A carry down boat launch and pier are located at the campground and a drive in ramp located about 0.5 miles away will help you get a line in the water. 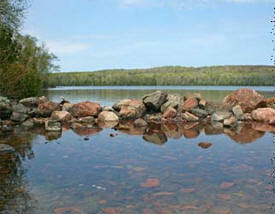 Devil Track Lake Campground is located 12 miles north of Grand Marais on Co. 57. Located in the Superior National Forest, East Bearskin Lake Campground is located on East Bearskin Lake at the edge of the Boundary Waters Canoe Area Wilderness. 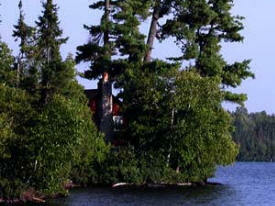 It is a perfect choice for people who want the flavor of the Boundary Waters and the convenience of car camping. Some sites are hike-in access. Site 2 and 20 are rentable camper cabins which sleep 5 in 4 beds (bunks, single, and double). There are no mattresses, bedding, cooking facilities, or bathrooms; bring sleeping pads, bags, and a cook stove. A boat ramp at the campground allows access to the lake by both motorboats and canoes. Be aware that the two eastern bays of East Bearskin Lake are within the BWCAW and require permits for entry. Day permits for non-motorized use are available at the campground, but overnight and motor use permits must be applied for in advance. 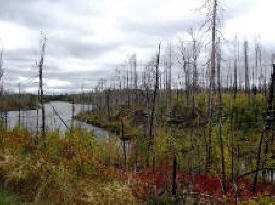 East Bearskin Lake Campground is about 26 miles northwest of Grand Marais on East Bearskin Lake. 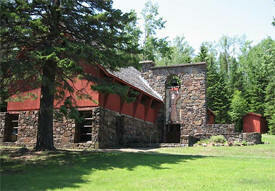 Located in the Grand Portage State Forest near Grand Marais Minnesota. The campground is adjacent to the public landing. The campsites are considered "primitive," designed to furnish only the basic needs of the camper. The campsites consist of a cleared area, fire ring, table, vault toilets, and garbage cans. All sites are on a first-come, first-served basis. Highlights: The campground offers swimming, water access (including a boat ramp) and hiking trails. 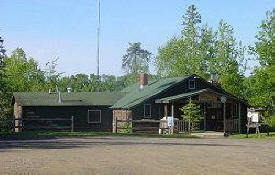 Forest service campground located in the Superior National Forest. Flour Lake Campground sits on the quiet shore of Flour Lake. 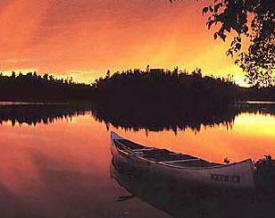 The eastern edge of the lake defines the border of the Boundary Waters Canoe Area Wilderness. Portages link Flour Lake with East Bearskin Lake and with Moon Lake, but be aware that if you enter the BWCAW, you will need a permit. Day use permits are available at no charge, inquire at the campground host site. Flour Lake provides great fishing for bass, walleye, and lake trout. The half mile Honeymoon Bluff Trail is just 1/4 mile up the road from the campground and offers a great vista of Hungry Jack Lake. 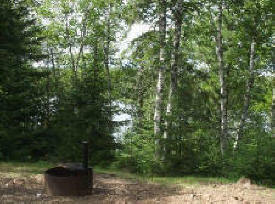 Flour Lake Campground is located on Flour Lake 30 miles up the Gunflint Trail northwest of Grand Marais. 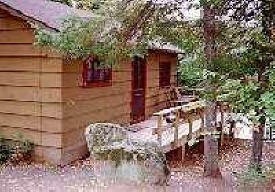 Golden Eagle Lodge now offers a Campground with the same personalized service as our cabins. We have 9 sites, each with a picnic table, fire ring, and water and electric hookups. Electric service is 20, 30 and 50 amp. Our shower house has 2 modern bathrooms with hot water and flush toilets. One Bathroom is wheelchair accessible with a roll in shower. A dump station is also available. These sites were designed to accommodate a variety of RVs, Campers, Trailers and Tents. To keep the wilderness feel, we limit each site to only 1 camp unit (1 tent OR 1 Camper OR 1 RV) and a maximum of 6 people. For those who wish to camp together, we offer 2 sets of adjoining sites, #2 and #3 or #4 and #5. The Gunflint Pines Campground offers some of the best lakefront campsites on the Gunflint Trail, and the only campground on Gunflint Lake! Nestled among the Cedar, Balsam, Spruce and White Pines of Gunflint Lake's southern shore, our campsites are well spaced averaging 40 ft apart. Nine of the sites have premium lake frontage. Each campsite has it's own picnic table and fire ring, 20/30/50 amp electric service and water hookup (no utilities on tent only sites). 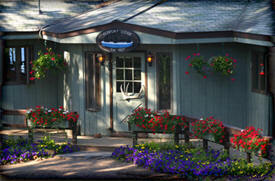 The bathhouse is centrally located offering hot showers and toilet facilities for our campers. We also offer a coin operated Laundromat & children's playground. Campers have full access the waterfront and marina area. No matter what you use for camping, Hungry Jack Lodge and Campground has a campsite just right for your summer or fall Minnesota family camping vacation. 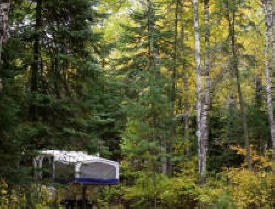 Our Gunflint trail campground has spaces for large motor-homes, 5th wheels, travel trailers, pop ups and tents. 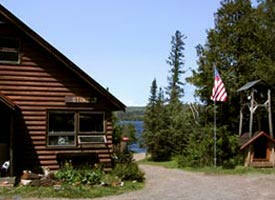 Camp sites at Hungry Jack Lodge and Campground, on the Gunflint Trail are secluded and wooded. 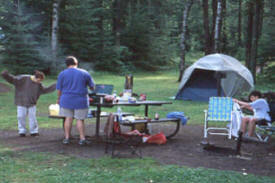 The campground at Hungry Jack Lodge & Campground makes an ideal “base camp” for paddling and exploring the BWCA. Hike, canoe and fish the BWCA and return to your comfortable base camp at Hungry Jack Lodge and Campground at the end of each day. Experience the BWCA and still have the comforts of a hot shower, flush toilets and the other amenities that the Hungry Jack Lodge campground has to offer. 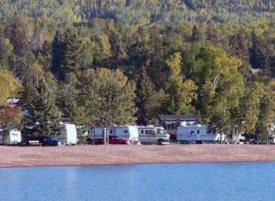 Located in the Superior National Forest, Iron Lake is a unique campground due to its remote location and small size. It is in an area burned over in the 2007 Ham Lake fire, and visitors can see post fire ecology including uncommon black-backed woodpeckers. Please stay on trails and roads; burned areas have hazards and forest renewal can be fragile. Fishing for walleye and northern is good. Blueberries are also abundant in the area. There are lots of canoeing opportunities. If you enter the Boundary Waters Canoe Area Wilderness, you will need to have a permit (self-issued for day use) and follow wilderness regulations including group size. There is a carry down boat access to Iron Lake. 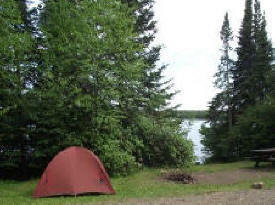 Iron Lake Campground is about 38 miles northwest of Grand Marais off the Gunflint Trail. Come for the quiet, the solitude, and the famous Devil's Kettle waterfall. The most popular hike leads from the trailhead upstream along the Brule River to Devil's Kettle, where the river splits around a mass of volcanic rock. Half of the river plunges 50 feet into a pool, while the rest pours into a huge pothole. Anglers can catch brook and rainbow trout in the Brule River or its tributary, Gauthier Creek. The park offers camping, picnicking and hiking. Heavily wooded campground with well-spaced sites. Modern sanitation building (showers/flush toilets) in the campground is available from Memorial Weekend through Labor Day. No winter camping at this park. Located in the Superior National Forest, Kimball Lake Campground is a small campground that is excellent for people who want to camp and fish. Kimball Lake is a small state-managed trout lake stocked with rainbow trout. Because of this special designation, anglers are required to have a fishing license with a trout stamp. A non-maintained trail circles the lake for shore casting. Adjacent Mink Lake has a sand swimming beach and barrier free fishing pier. 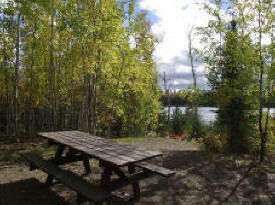 Kimball Lake campground is located about 12 miles north of Grand Marais on Kimball Lake. This campground has a picnic area, boat launch, and fishing access trail. 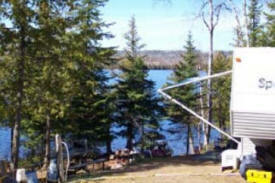 Additionally, there is a swimming beach and accessible fishing pier located at nearby Mink Lake. 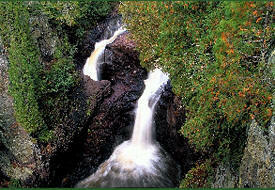 Located in the Grand Portage State Forest near Hovland Minnesota. The campsites are considered "primitive," designed to furnish only the basic needs of the camper. The campsites consist of a cleared area, fire ring, table, vault toilets, garbage cans, and drinking water. All sites are on a first-come, first-served basis. Highlights: There is swimming, water access (including a boat ramp) and access to the Boundary Waters Canoe Area and Border Route Hiking Trail. If campsites are occupied, you can find camping at Judge C.R. Magney State Park. 5 campsites. On the shore of Poplar Lake, and right next to our dock and sandy beach, we offer wooded campsites complete with electric and water hookups. Pitch your tent or park your RV at any one of our beautiful campsites. The kids can have fun on the beach, swim, take out a paddleboat, or play at the playground or in the old-time fort. 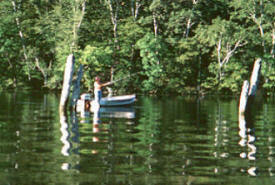 Rent a canoe or a boat and motor, or bring your own -- the fishing is great! On the premises, we have hot showers, flush toilets, and a central dump station. For your convenience, you can buy groceries, bait, fishing and camping gear, and unique Northwoods gifts in our gift shop, located right across the road from the lodge. 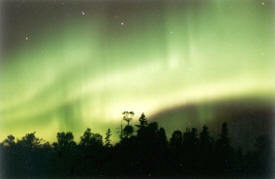 Come sleep under the stars and northern lights at Nor'Wester Lodge on the Gunflint Trail. 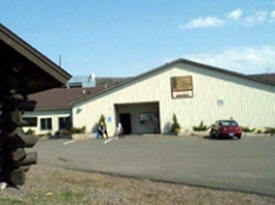 Forest service campground located in the Superior National Forest. This beautiful campground features bedrock outcrops among white and red pine. The 2007 Ham Lake Fire bounced through the area, leaving some heavily burnt sites, now regenerating, and some untouched sites. It is an excellent spot to see fire ecology in action. Many campsites are hike-in, view or access water, or have steep drop-offs. 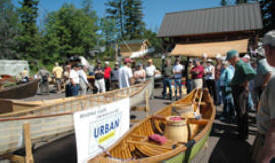 Commercial services include canoe rental, outfitting, showers, and sales of groceries and gear, and a restaurant. 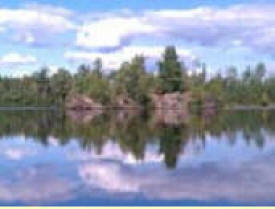 The campground provides access to entry points 54, 55, & K for the Boundary Waters Canoe Area Wilderness. There is long and short term parking for the BWCAW. Day use and overnight BWCAW permits (if quotas allow) are available for those entering the BWCAW. 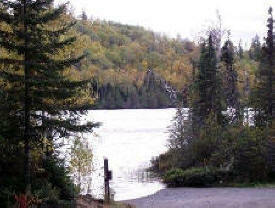 Trail’s End Campground is about 57 miles northwest of Grand Marais at the end of Co. 12 (the Gunflint Trail). 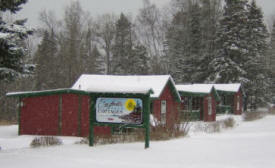 Forest service campground located in the Superior National Forest. Two Island Lake Campground is near Grand Marais, but off the beaten path. It offers the services of a fee campground with water, toilets, and trash containers, plus a boat ramp on a lake filled with walleye, smallmouth bass and northerns. For an even more secluded camping or canoeing experience, the nearby Twin Lakes Canoe Route offers backcountry canoeing and campsites similar to those in the Boundary Waters Canoe Area Wilderness. 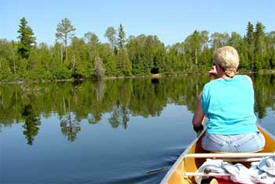 See the Camping and Twin Lakes Canoe Route information sheets for more details. The Eagle Mountain Hiking Trail is four miles to the west of Two Islands and provides a hike into the Boundary Waters Canoe Area Wilderness to the top of Minnesota’s tallest peak, Eagle Mountain. 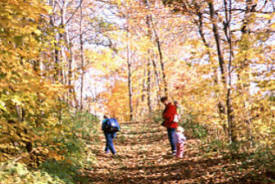 A trail map with more information about travel in a wilderness area is available. 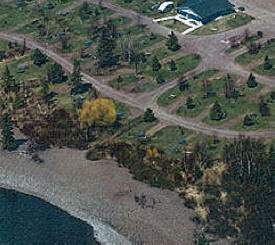 Two Island Lake Campground is about 15 mi northwest of Grand Marais.